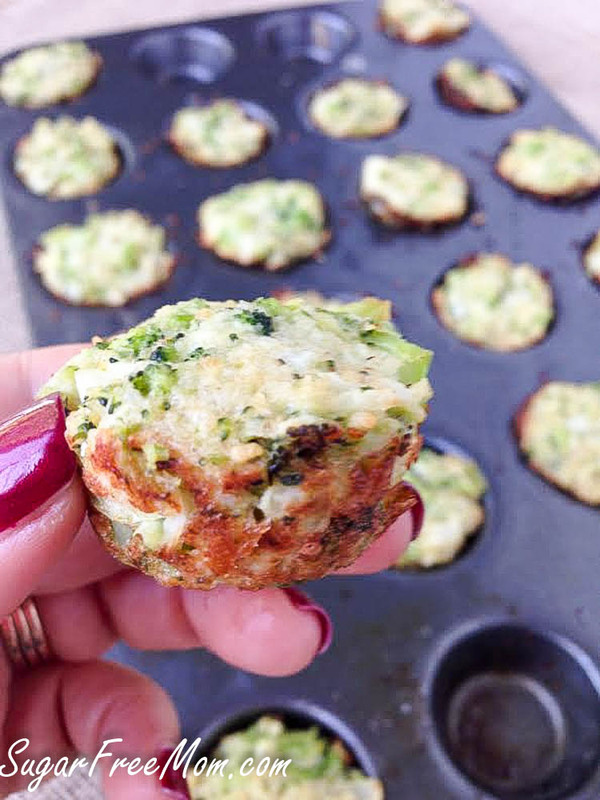 Broccoli Cauliflower Quinoa Bites are gluten free, low in carbs and calories and a perfect simple side dish that even the picky ones will enjoy! By the time you read this I should be settling into a wonderful week at Disney for the first time with my family! If I scheduled it well and the weather cooperates while there we should have already visited Hollywood Studios and Animal Kingdom. Today we should be at Sea world, but you know how schedules go, they can change in a instant! Preparing for this trip has been completely exhausting. 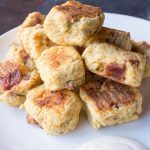 Doubling up on recipes and writing on top of an always crazy, busy week with the kids and activities and my hubby being out of town for work has been utterly…. un-fun, let’s just say that! But I knew if I wanted to enjoy the week in Disney and not have to be on the computer doing all the social media aspect of blogging, well, I knew my hubby and family would appreciate it and I knew I wouldn’t be so stressed, rushing around like a mad woman online, in order to leave for a park on time. If you’re a blogger you know the routine and if you want to maintain traffic, it’s all part of the juggle. If I don’t post, traffic is down. I’m not at the point in life where I have the ability to pay anyone to do any of the work I do and to be frank, don’t know I’d trust anyone to do it for me either lol! Taking the kids to Disney and on a plane for the first time was something we’ve had in the works for over a year. I’ve always wanted to take them at least once but the hubby has been reluctant. Our boys are daredevils and love rides but our daughter is the complete opposite. Although she is taller than me at the age of 11, her size doesn’t matter much when it comes to maturity. She doesn’t like to take risks nor likes heights. Knowing this has how she has been since a baby, hubby is pretty sure she won’t participate in much while he goes on rides with the boys and I have to stay back and watch her. But I am believing she will be excited to try some new adventures and surprise us. I am optimistic she will do more than we expect and our money for the tickets won’t be wasted. My only concern besides our daughter being difficult at Disney is the problem of eating out. The great things about going to Disney in September is they offered us a free meal plan which helps a family immensely because it is quite expensive eating for 6 of us (my sister-in-law is coming too). So my concern is finding gluten free options for me as well as low carb. I’m really working hard to take off the weight I put on when writing the cookbook. Did you know its available for pre-order now? Super excited about that but it put a toll on my stress and my body. Anyway, eating sugar-free can be a challenge when you have no control when not at home and traveling. My goal this week will be to find locations in the parks that offer someone like me allergy friendly options. I will certainly be taking notes, and pics and sharing my adventure in a post at some point. Even though I’ve been eating low carb lately, I still love quinoa from time to time. Unfortunately the family does not. Nor do they like cauliflower when they can see it in a recipe that is! 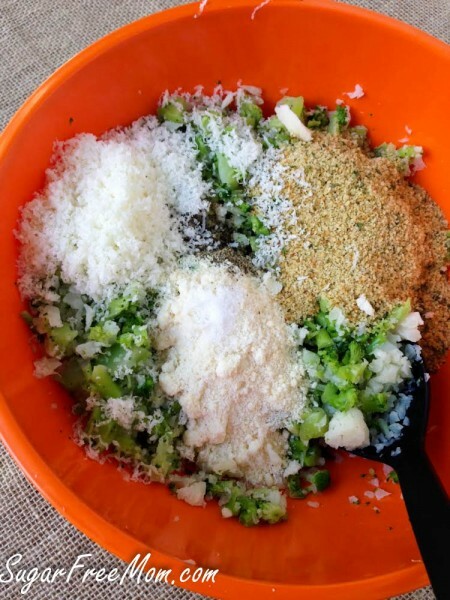 Even though this recipe contains some quinoa and often people associate quinoa with NOT being low carb, I used is a very small amount. So small in fact that per serving for 6 of these mini’s the net carbs is only 4 grams!! My kids love broccoli so the only thing I needed to do to pull this recipe off and get them to eat it this was to hide the cauliflower and quinoa. I placed the cooked cauliflower in my food processor and once mixed in with the cheese in the recipe they had no idea nor did they see the quinoa. Steam the broccoli florets and set aside to cool. 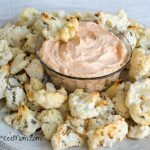 Steam the cauliflower florets then place into a food processor and pulse until the size of crumbs. Allow to cool. In a large bowl, combine the remaining ingredients. 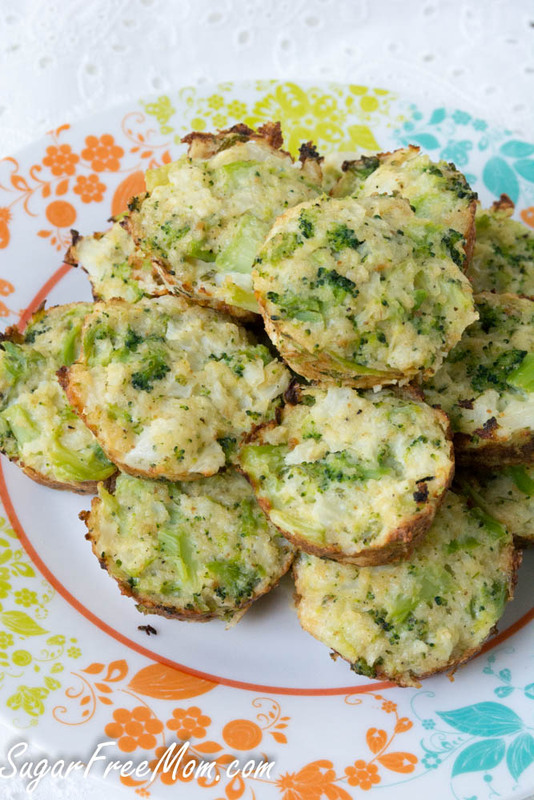 Toss in the cooled broccoli and cauliflower florets and mix until combined. 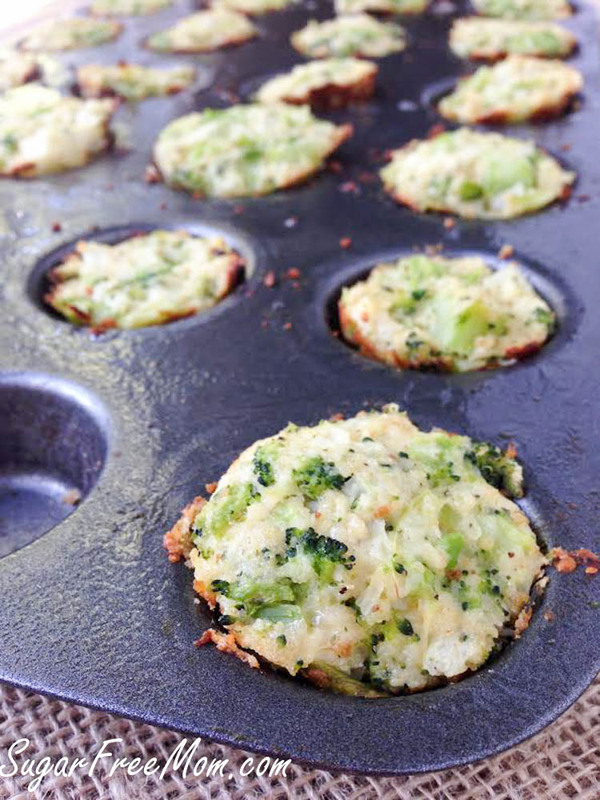 Spray or grease mini muffin pans and press mixture into muffin cups. Bake at 350 degrees for 15-20 minutes until golden. Makes 3 1/2 dozen. This looks tasty and i love everything except the cheese as dairy clogs up my sinsus and nose terribly. Is there any possible non dairy substitute for the parmesan and mozzarella please? This recipe sounds great!! Will definitely try but with Daiya brand dairy-free cheese alternative. 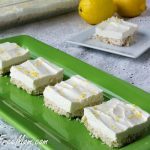 It melts like the real stuff and tastes really yummy! Has anyone tried making this with no cheese at all? I don’t have the dairy-free cheese at home and was curious. 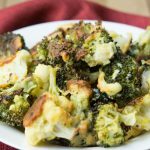 Is there an advantage to using frozen broccoli and cauliflower over fresh for this recipe? Nope you can use fresh, I just like my frozen and I always have extra in my freezer so I never run out. Is there any substitute you could suggest for the eggs? I don’t include them in my diet but I’d really like to try these! Possibly chia or flax eggs? 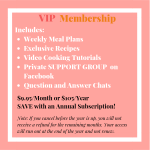 I’m with Karen – is there a reason to use frozen instead of fresh veggies? I will like Wendy substitute Daiya mozzarella and use sheep myzithra for the parmesan. LOVE quinoa so probably will increase that a bit. Would they be able to be made into regular size muffins for convenience and not scrubbing all those little cups? 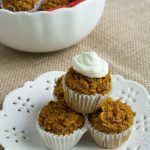 Have You tried to use muffin cups for ease of clean up? TY & bless You and Yours for Your hard work. You could make them into regular muffin size but if you increase the quinoa be sure to increase eggs or other liquid to hold them together . I haven’t tried using muffin cups for these although I would suggest silicone not paper liners. I used fresh broccoli and cauliflower and it was great! Might this be baked in a 13 x 9 casserole dish or smaller and served as squares to avoid the “bite” sized muffin pans? It sure sounds like a great recipe to me. I am looking forward to making and eating it. This recipie is great! Took it to our easter dinner last night and they were gobbled up. I don’t have food processor, but just cooked the cauliflower long enough that it was easy to break or chop into little pieces (no cauliflower haters here anyway), and it was great. Thanks for sharing:). 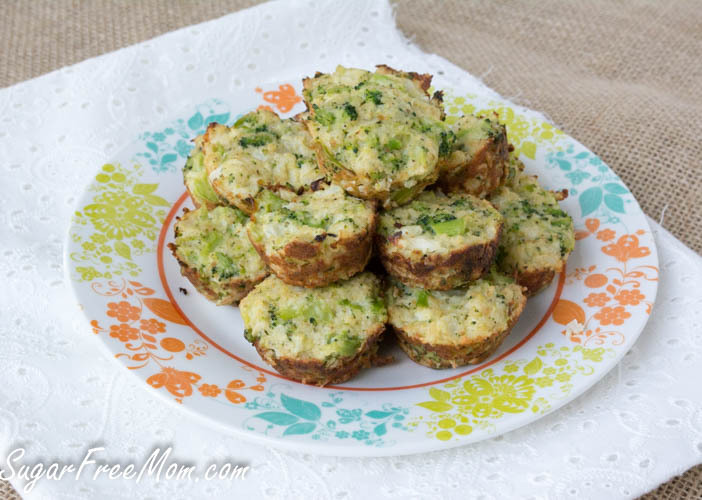 May try these with some zucchini next time too! I just made these and the bottoms did not get brown at all and it’s not really staying together well. Any idea why? If they didn’t get brown sounds like they needed to go in for longer in the oven. Has anyone done the nutritional information conversions for full size muffin tins? How many mini’s make up a full? 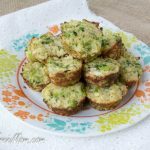 I really enjoyed these (I subbed fresh broccoli and cauliflower for the frozen), but I would definitely make them in regular muffin cups (which I did with some). It’s a really portable and tasty lunch. Do these freeze well? How long could you freeze them for? Sorry ours are eaten right away, never froze them but I would imagine at they’d stay good at least a month frozen. Delicious! Turned out great 👍 thanks for the recipe. What is the serving size? I know it is 3 points for WW. That includes how many bites? Hi, just stumbled across this recipe. My son has a milk allergy, so do you think this would still be good without the cheese? Thanks! I’m not sure it would hold together well with the cheese since I’ve not tried it myself.